It is essential to use installing tools and anchors that are properly rated for trucks during the installation of power-installed screw anchors (PISA®). The high torque energy used in installing high-strength anchors requires the control of hazardous torque, which can be safely completed by proper tools. When anchor torque and digger output capacity exceeds 10,000 ft.-lb., use the 15,000 ft.-lb. CHANCE® Tough One® anchor wrench assembly. The high-strength assembly is designed for the current market's anchors and installation trucks. The locking dog assembly and Kelly bar adapter for the high-strength wrench assembly uses a 7-5/8” bolt circle with 5/8” Grade 2 bolts compared to the 5-1/4” bolt circle with 1/2” Grade 5 bolts used on standard strength 10,000 ft.-lb. tooling. The larger bolt circle used in the high strength tooling puts less stress on bolts and, in conjunction with the larger bolts that are used, allows installing torques to reach 15,000 ft.-lb. during demanding installations. High-strength power installed screw anchors (PISA®) tooling has a longer socket on the Kelly bar adapter and locking dog assembly. This results in less wrench wobble during installation and reduces stress on bolts. There's greater strength with these two products because they exceed in thickness and heaviness in comparison to 10,000 ft.-lbs. rated units. A thicker anchor-drive wrench extends fatigue life and increases torque strength. If a single installing tool component fails, the tremendous torsional energy transmitted by the tooling can be released violently. This sudden energy release can cause personal injury or property damage. It is essential that proper anchor-installing tools be used. Beware to not interchange installation tools of different manufacturers. Whether you use installing trucks with more than 10,000 or 15,000 ft.-lbs. of installing torque capability, do not exceed anchor or tool ratings. If done,stress the wrench system may be stressed beyond its designed safety limit. 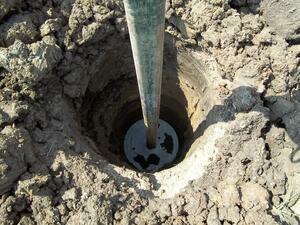 Installing anchors beyond the safety limit will subject the wrench system and the operators to a hazardous condition.